Miguel Herrero y Rodriguez de Miñon is a Spanish politician and lawyer, one of the seven fathers of the 1978 Spanish constitution. He studied law and philosophy in Madrid, Oxford, Paris and Louvain. As Technical General Secretary of the Ministry of Justice, Miguel Herrero worked actively on the electoral legislation of the new Spanish democracy. 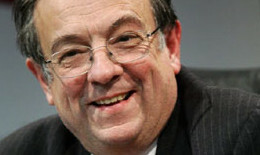 He served as spokesman of the lower house of the parliament, both for the governing party (UCD) and the opposition (AP). His long career includes the posts of Director of Banco Exterior de España, Vice President of the Legal Committee of the Consultative Assembly of the Council of Europe (1979-1982) and Vice President of the Political Commission of the North Atlantic Assembly. Miguel Herrero has been a member of the Royal Academy of Moral and Political Sciences since 1991. As a scholar of constitutional law and international relations, he has published extensively and also works as a lawyer and consultant.